We took a trip to Pigeon Forge Tennessee this past weekend. With our Garmin Nuvi GPS leading the way, I wondered how we ever managed without one. In some ways, having that GPS makes a road trip shorter because the GPS chunks the trip into shorter segments. Mentally, as you watch the GPS you are thinking about getting to the next turn. How many steps are in the checkout process – It’s good for the customer to see the steps required in the checkout. Typically, they will expect to enter information about delivery and payment. 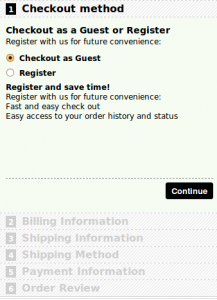 Their current location in the checkout process – This gives the customer a clue as where the final order submit button resides. It’s important for your customer know exactly when their order will be placed and payment charged. The ability to go backwards to a specific step if they feel they have made a mistake – Customers can use the visual cues to also navigate within the checkout process. This allows for quick navigation if they know they have made a mistake or would like to change an option bore submitting the order. Which method do you prefer and find easiest to navigate as a customer? If you are a marketer, have you tried both methods to see if the conversion of customers differs?